By most accounts, Justin Upton has delivered on his promise as a former number-one draft pick and top prospect, hitting 190 home runs and averaging roughly four wins per season since turning 21 years ago. Upton has a rare power-speed combination, he was called up at an early age, he hits for consistent power, and he is still just 28 years old. Yet, not unlike another former first-round pick also hitting free agency, Jason Heyward, Upton is regarded by some as a slight disappointment, if unreasonably so. It is Jason Heyward, with even more youth than Upton to go along with great defense, who is seen as the best position player on the market despite hitting just 13 home runs this past year. Upton’s age, however, should not be dismissed, as he is still younger than most free agents on the market and combines that youth with the promise of considerable power. Justin Upton will still get paid. Jon Heyman hit a high mark publicly, predicting seven years and $161 million, but FanGraphs crowdsourcing came up with six years, $120 million with Dave Cameron adding an extra year at $20 million to sign with the Yankees. That Upton’s contract is likely to be only the fourth, fifth or perhaps even sixth biggest contract of the offseason speaks to the quality of this free agent class as well as the amount of money that has been added to baseball’s revenues over the past few years. Six years ago, Matt Holliday signed a seven year, $120 million contract with the St. Louis Cardinals. Since then, nine position players have signed $100 million contracts in free agency and player salaries have increased by 50%. Upton’s six year, $51 million contract served to delay his free agency by two years, but because he debuted at just 19 years old, he is still in position to sign a big long-term contract before the aging process begins his decline. A trade to San Diego is probably not ideal for any hitter prior to free agency, given the considerable advantages it gives to pitchers. Petco Park opened in 2004, and prior to this season, the season-high for home runs by a right-handed hitter at Petco was 13 by Jedd Gyorko. Will Venable holds the mark for all Padres hitters with 15 home runs at Petco back in 2013. The Padres moved their fences closer in 2013, but the park is still very tough on right-handed hitters, with only the Giants’ and Pirates’ parks suppressing home runs more substantially. Justin Upton managed 15 home runs at home this season, more than any right-handed Padres player has recorded in the last dozen years. He has reached a point in terms of age and experience when it’s irrational to assume he’ll improve in any of these areas, but still rational to price some small probability of improvement into his value. He is simultaneously a good bet to be overpriced by the market, and a nonzero bet to beat his projections by a wide margin. The players above are not a perfect match with Upton. For a bit more perspective, I included another line for Upton which excluded his age-19 and age-20 seasons. Upton is a bit ahead of most of these players defensively while a decent amount behind offensively. Players like Boog Powell, Greg Luzinski, and Jack Clark were not outfielders for very long. This is the difficulty in finding comparables for Upton — he has the power of a lumbering slugger, but the speed of a center fielder. It is also what makes his talent so desirable. Comparisons to players like Strawberry and the chemically enhanced Canseco offer insight into the type of player Upton has been so far, but also presents a murky future. We can take a look at how the players aged to get a decent grasp on the possibilities for Upton. First, looking at the likely good years of the contract in ages 28-31, the group performed fairly well, but did not provide much in the way of excitement. Two-and-a-half wins per season is hardly a bargain when a team is paying $20 million per year, but it is also roughly the going rate on the free agent market. 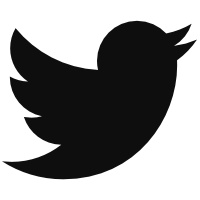 The problem comes when the team is paying for production into the mid-30s and not receiving the same. 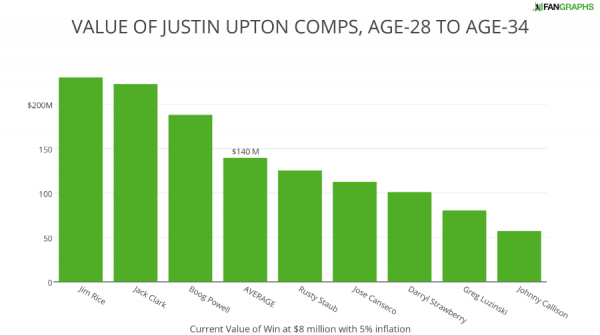 Here are the Upton comps from age-28 to age-34, a seven-year period. There are three clear successes, and after that, mostly mediocre production. The comps actually go well with Keith Law’s comments above. Pay Upton at the average, and you are more likely than not going to fail to get a positive return, but there is that chance of getting good value still out there. Turning each of the above players’ production as well as the average into dollar terms, here is a graph of the value based on a current $8 million per win with 5% inflation. An investment in Upton is not one that should be made by a conservative, risk-averse team. Upton’s contract is unlikely to look good at the end of its term, but it does have some upside. Justin Upton’s power is among the best in baseball. Justin Upton is one of only six players to have an isolated slugging percentage above .200 in each of the last three seasons. The other five: Chris Davis, Edwin Encarnacion, Jose Bautista, Mike Trout, and David Ortiz. In the last six offseasons, ten position players have signed free agent contracts in excess of $100 million. Before this offseason, the only player with two seasons left in his 20s was Prince Fielder. Seven of the ten players did not come with a single season before age 30, and only Jose Reyes and Carl Crawford played a single season at age 29 under their new contracts. While Upton’s star does not shine as bright as it did a few years ago, and he has been passed by former teammate Jason Heyward in free agency, his power and youth will get him a significant payday. We hoped you liked reading Justin Upton’s Youth and Power in the Free Agent Market by Craig Edwards! How Did Previous Andrelton Simmonses Age? Articles like this are why I come to fangraphs.